The US space agency's (Nasa) spacecraft and satellites could soon have their own net address. The agency is working on a project to make it easier to retrieve data from space vehicles in orbit or deep space and is turning to net data protocols to help. The project will allow mission scientists to use a standard web browser to monitor spacecraft and to swap data with them or their crews. The technology to link spacecraft to the web is being tested on the current space shuttle mission and briefly turned the Columbia craft into a node on the net. Nasa is keen to use standard terrestrial techniques to route data to and from satellites and spacecraft to cut costs and make off-planet resources easier to manage. The space agency currently uses a mish-mash of ageing hardware and software to keep in touch with spacecraft and to ship data back and forth. By converting to tried and tested technologies used to keep the net running, Nasa believes it can cut the numbers of staff needed to ensure spacecraft stay in touch. To test the technology the Columbia space shuttle was fitted with an embedded PC that has a 233 MHz processor, 128 MB of RAM and a solid-state 144 MB hard drive. 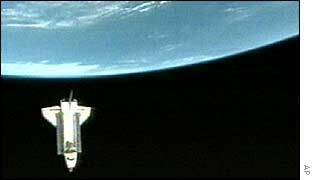 The computer is running Red Hat, a version of the Linux operating system, and is maintaining a connection with the Goddard Space Flight Center which will to try to contact the onboard PC more than 140 times over the duration of the shuttle mission STS-107. Maintaining contact with orbiting spacecraft presents its own problems. One of the main problems to deal with is the fact that the shuttle is constantly moving and as a result must regularly change the route used to contact the terrestrial network. Nasa scientists behind the Omni project (Operating Missions as a Node on the Internet) have developed a way for the shuttle to hand its communication needs to different satellites and ground stations as it travels. In effect the craft stays in constant touch with its handlers at the Goddard Space Flight Centre in Washington even when it is on the other side of the world. Once fully developed, the net-based communication system will give astronauts and hardware aboard the shuttle much more freedom to communicate with the Earth. Data sent to and from space also needs improved error correction to ensure that it is not scrambled or corrupted by the extremes of radiation present in space. The current shuttle mission is due to end on 1 February. The technology to turn spacecraft into net nodes was first tested in late May 2000 on the UoSat-12 mission. The world's first orbiting web address travelled on this small satellite which was developed by Nasa and the UK's Surrey Satellite Technology company.